David Hogarth portrays Alexander as having very little respect for his religion. As a boy, he had treated cavalierly even the Pythia. As a man, he refused to listen when a soothsayer forbade his venture across the Sir Daria; he committed palpable fraud with the auspices to save his dignity at the Sutlej; and replied with scornful sarcasm to the last warnings of the prophets of Bel. But he does not tell the whole story. It is true that Alexander was very unkind to the Pythia, dragging her to the shrine so that she could prophecy for him (Plutarch Life 14) on a day when it was illegal for her to do so. And while he did indeed ignore Aristander who told him that the omens were against him, he only did having respected an earlier injunction against crossing the Sir Daria (i.e. the Tanais/Jaxartes), and, I should add, after being continually provoked by the Asian Scythians on the other side of the river (Arrian IV.4). As for the events at the Sutlej (Hyphasis) river – Neither Curtius, Diodorus, Justin, nor Plutarch mention Alexander sacrificing there following the Macedonian army’s revolt. Arrian does (V.29) but there is nothing in his words that should make us suspect that Alexander fixed the result in order to save face. If there was fraud on the banks of the Hyphasis river it was in the gigantic altars that Alexander set up. Curtius (IX.3.19) says that he wanted to create a ‘fraudulent wonder’ while Plutarch (Life 62) refers to them as ‘a number of ruses and deceptions’. Arrian (V.29) describes the altars ‘as a thank-offering to the gods’. Whichever way we look at them, though, is a moot point, as they were not what Hogarth was talking about. The nature of Alexander’s response to the (Chaldaean) prophets’ warning not to enter Babylon on pain of death depends on who we read. Arrian (VII.16) records Alexander as quoting Euripides to them: ‘Prophets are best who make the truest guess’, which is not what I would call ‘scornful sarcasm’. Diodorus (XVII.112) says that Alexander, at first, paid heed to the prophets before being turned against them by Anaxarchus and the Greek philosophers. When that happened, ‘he came to despise all prophetic arts, and especially that which was held in high regard by the Chaldaeans’. How could Alexander change his stance so quickly? I would suggest he was still emotionally vulnerable after Hephaestion’s death. Plutarch (Life 73) says that Alexander ignored the Chaldaeans’ warning but there is no mention of sarcasm by him. Justin (Epitome XII.13) follows Diodorus in having Alexander listen to the Chaldaeans before – under Anaxarchus’ influence – deciding to ignore them. To be sure, he does say that Anaxarchus persuaded him ‘to slight the predictions of the Magi as fallacious and uncertain’ but would this have happened if Alexander had not been in a vulnerable state? 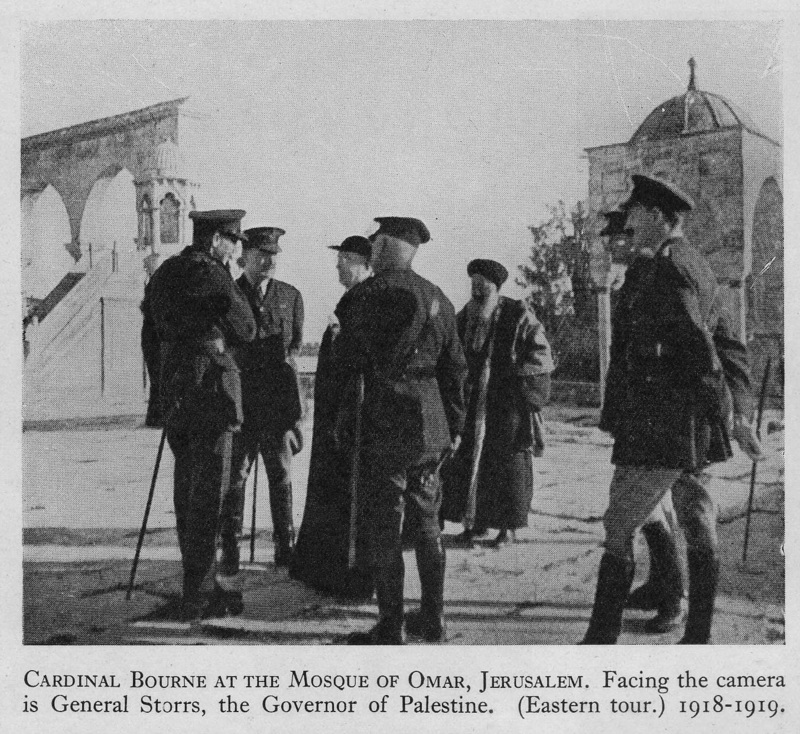 As the text says, we see in the photograph Cardinal Bourne speaking to General (Ronald) Storrs. He is of interest to me because of his connection to T E Lawrence. The two men served in the Middle-east, for a while working at the same time out of Cairo during World War One. Like Lawrence, Storrs was a classicist. In May 1916, Sheriff Hussein decided to begin the Arab revolt agains the Ottoman empire. He asked the British for money to help pay for it*. Storrs, along with David Hogarth* took some (not all – the British wanted to make sure the revolt began before they gave the rest) of the requested funds to Sheriff Hussein. On 28th December 1917†, Storrs was appointed Military Governor of Jerusalem** – the first, he said, since Pontus Pilate††! This was not the only occasion when the Bible was to be remembered. When General Allenby entered Jerusalem, he did so through the Jaffa Gate and on foot out of respect for the city’s status as a holy city in Christianity, Judaism and Islam†††. In 1936 Storrs acted as one of the pall bearers at T E Lawrence’s funeral. With that all said, you may be wondering how I got from General Storrs and Cardinal Bourne to Alexander the Great in the first place. Well, seeing the General and Cardinal put me in mind of Alexander and Aristander. That’s all I might have written had I not read the passage from Hogarth’s book above earlier today, which led to this rather longer – and I fear, convoluted, post.